I spend almost more time looking for and reading reviews of movies than I do watching them. I don’t have the time to waste on a bad movie during the school year, and though I have more time at home during the summer never do I want to watch something that will be blasphemous, offensive, or pass before my eyes things I can’t unwatch. I know you feel the same. Here is a synopsis and review of a movie I feel is worth watching for the entire family (tweens and up): Queen of Katwe. 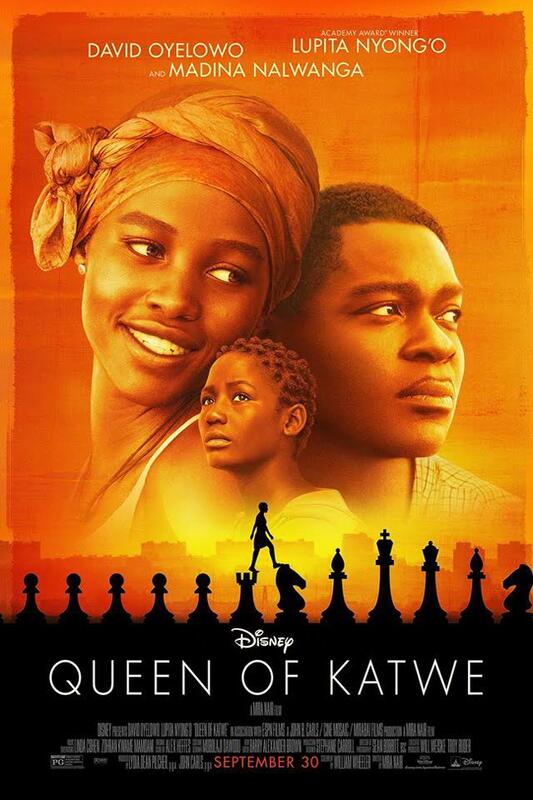 The movie summary says: A school-drop out named Phiona (pronounced like Fiona) living in the slum of Katwe sells maize along with her brother to help her family survive. Her older sister has already succumbed to the lure of being a kept women and the widowed mother is wearily but with dignity striving to instill in her remaining children hope where it seems that life is hopeless. At this moment in their family life Phiona is discovered to have an agile and highly advanced mind and is a genius at chess. That this is a true story and in fact it has recently occurred, which makes it all the more compelling. At the end of the movie you will see each character and what has become of them. In addition to the themes noted above by Common Sense Media is one that is often overlooked: the cycle of poverty. The slum outside Kampala Uganda known as Katwe is one of the largest and most dire of slums in that country. The overwhelming filth, poverty, and dense living conditions are not glossed over in this movie produced by Disney. As Phiona rises through the ranks in chess championships and her world gradually expands, eventually she must come to terms with who she is and if her origins define her character or if her character will define her character. The interplay of rich v. poor, impoverished origins v. entitlement impact the girl greatly. It’s a similar theme shown in My Fair Lady. As Eliza Doolittle rises from Cockney impoverished flower girl to genteel lady she wonders where she belongs and who she is if she is no longer “poor” and has to struggle for survival. Will Phiona take the daring leap into the unknown or retreat into what she is used to, even though that means remaining a cog in the grinding cycle of poverty? At points, the outcome is by no means certain and the movie deftly shows why. For family viewing, several scenes are mildly intense. Phiona’s brother is run over by a motorcycle and Phiona’s desperate near-helplessness to get him to a clinic and obtain the medical services he needs are gripping. Throughout the movie I’d wondered why the slum shacks are entered by walking over planks or pallets situated over a deep trench. The flood scene showed me. Monsoon rains are beyond heavy and Phiona’s toddler brother nearly dies in a flood that sweeps through their derelict home. I read later that Katwe’s seasonal floods are so bad that people sleep on their roofs – if they have a roof – so as not to drown at night. The scene that most affected me is when the chess team has traveled to a fancy championship location and they are put up in dormitories for the night. The youth pastor who leads the sports ministry, including this chess team, is momentarily startled when he arrives at their room to tuck them in, all the beds are empty and all the bedding remained where it was at the first, neatly folded and piled on the end of each cot. A momentary panic rises in his eyes until he sees all of the children huddled up on the floor in the corner, slum family style, their own clothes and brought scarves and fabrics for covers. It was what they were used to. The movie does not gloss over the entrenchment of the cycle of poverty the difficulties in rising out of it, and the lingering issues that haunt those who do, including prejudice of the entitled against the poor. Though one of the main characters is a youth pastor, and his chess club is part of a sports mission, no mention is made of Jesus or what denomination he is from or any religious discussions at all. However, he is depicted as a trustworthy man fighting for his charges with love and devotion. It’s produced by Disney so the production values are excellent. Recommended. Is the Wisconsin company microchipping employees a fulfillment of the Mark of the Beast?